Zpacks (http://www.zpacks.com/) was really one of the first cottage manufacturers to use cuben fiber. In fact, owner Joe Valesko uses it nearly exclusively and his own backpacking endeavors proved its long-term staying power in the lightweight backpacking industry. When I really want to test how light I can go, I bring along one of his Blast packs and Hexamid Duo tents. Both are so absurdly light that it's nearly comical. As I've mentioned before, I usually bring a ULA-Equipment Rain Wrap with me for my lower body. To me, it's a multi-use item as it not only keeps my lower body relatively dry, but it is a nice extra piece of sylnylon which I've used as a ground cloth, quilt protector, pillow, and vanity cover when bathing or doing laundry on the trail. I've also rigged it to my Hexamid to serve as a door in severe weather. Zpacks has decided to make this already great idea a little better by making it out of cuben. The TrailLite Designs Cloud Kilt for $55 is a mere 1.6 oz and is essentially the same product. I've asked Joe to see if he can tinker with the design a bit to make it a dual-use item specifically designed as doors for his Hexamid line. Now before you start saying a kilt isn't for you, think about it long and hard. 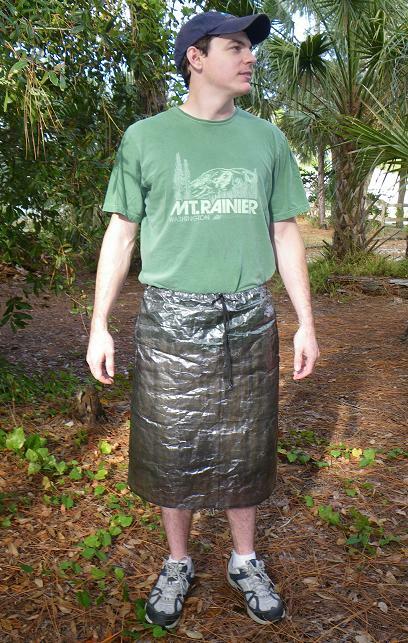 Aside from the multi-use aspects which a pair of rain pants just can't offer, a skirt/kilt is easier to put on, offers better ventilation, is lighter, and really keeps the vital stuff dry. As one poster mentioned when talking about gaiters, few seem to care whether their shins or ankles are dry.